That Bollywood In Yellow Boots! Colors speak a lot more than just shades of your wall, clothes or anything possessing materialistic value. The color you choose defines your persona as an individual as well. For example, if yellow is your favorite color, you are the one who always cheers up everyone, believes in healing rather than destroying and are really good in communication skills! 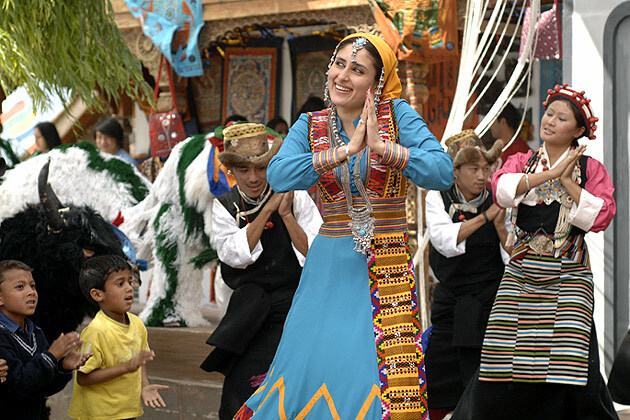 Being free-spirited is one theme that Bollywood movies depicted for the longest time. Be it Dil Chahta Hai (2001) or Zindagi Na Milegi Dobara (2011), Bollywood makes sure to leave no stone unturned when depicting this flavor of yellow. Come on, do we even need to dig in deeper? No Bollywood movie is ever complete without having a little flavor of joy and laughter. And we guess that’s what life is all about, isn’t it? It is really important to stay optimistic in life and even Bollywood has been telling this to us through almost every other movie. 3 Idiots (2007) was definitely the movie that defined how to stay positive in life and believe in ourselves. When we talk about energy, the first thing that comes to our mind is Kareena Kapoor. The kind of enthusiasm she portrays in movies likes Jab We Met (2009) and Bodyguard (2011) is exhilarating. Last but not the least, happiness! With so many problems in life, we almost forget to smile even once in the entire day. If you want to live long, you need to stay happy and content. Movies like Queen (2014), Dum Laga Ke Haisha (2015), Khosla Ka Ghosla (2006) and Do Dooni Chaar (2010) explain it all. So this Navratri, don’t forget to add some of these elements of yellow to your life.